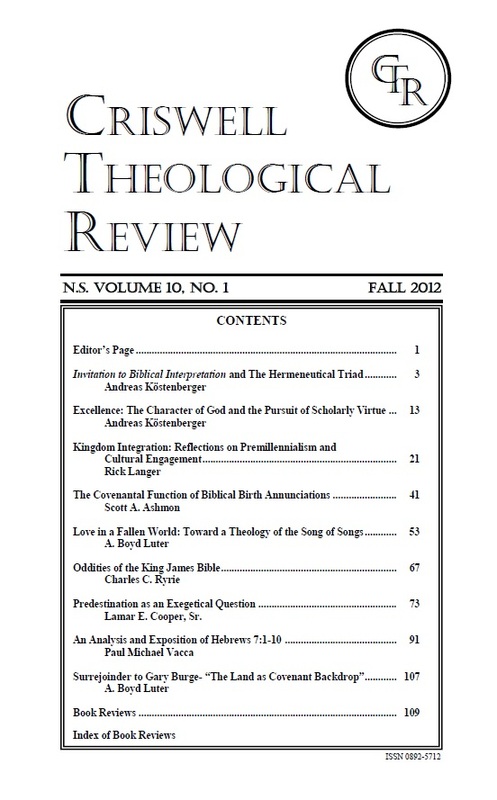 The Fall of 2012 marks a new transition in the life of the Criswell Theological Review. For approximately a decade, Dr. R. Alan Streett has served as editor and successfully maintained a high standard of scholarship for this publication. Scholars from numerous backgrounds have contributed to previous volumes with the byproduct being a healthy colloquial setting. Now as a colleague of Dr. Streett, I humbly step into the role as editor with the determination to maintain the same standard of quality so that our readership can continue to benefit. That being said, the Fall 2012 edition includes a compilation of articles on numerous topics. Our first two articles are lectures that were presented in the Fall of 2011 at the annual Criswell Theological Lectures Series at Criswell College. The speaker was Dr. Andreas Kӧstenberger, who serves as Professor of New Testament at Southeastern Baptist Theological Seminary in Wake Forest, NC. The lead article is a lecture wherein Kӧstenberger presented his reflections on the nature of biblical hermeneutics which were based on a current book that he co-wrote with Richard D. Patterson entitled Invitation to Biblical Interpretation. The second article was a subsequent lecture in which Kӧstenberger admonished young seminarians to pursue character as well as academic excellence. This lecture was also based upon a current volume Kӧstenberger had written entitled Excellence: The Character of God and the Pursuit fo Scholarly Virtue. Our third article is by Rick Langer, professor of Biblical Studies and Theological Integration at Biola University in La Mirada, CA. This entry addresses the dilemma of cultural engagement, which many premillennialists (dispensationalists in particular) have struggled with throughout most of the 20th century. After analyzing the problems, Langer offers his thoughts on how premillennailists of different stripes can possibly utilize inaugurated eschatology as a platform for overcoming this impasse and also develop new ways to integrate faith and learning. In our fourth article, Scott Ashmon, Professor of Old Testament and Hebrew at Concordia University in Irvine, CA, surveys the assorted birth annunciations in Scripture. He does so to show the covenantal symmetry that appears to connect each of them together. Likewise, he shows how they build thematically and culminate in the birth of Jesus, the Messiah. Our fifth article follows with another Old Testament theme, but this time it pertains to the interpretation of the Song of Songs. Herein, Professor for Liberty Theological Seminary, A. Boyd Luter, discusses how this book encapsulates a love story in such a way that harkens back to thematic overtones in Genesis 1-3 so as to emphasize how the marriage covenant can be exalted in light of the fact that we live in a fallen world. Our sixth contribution is by former professor of Dallas Theological Seminary and esteemed author, Charles Ryrie. His essay is a lecture that he presented at a special conference that Criswell College held in Fall of 2011 to celebrate the 400th anniversary of the King James Version. His particular topic was various “Oddities in the King James Bible” and he graciously agreed to allow this lecture to be part of this Fall 2012 edition. In our seventh article, Criswell College’s own Professor of Old Testament and Archaeology, Lamar E. Cooper, Sr., proposes an alternative understanding of the concept of predestination. Specifically, he argues that both Arminians and Calvinists fall short in their theological paradigms because they emphasize one biblical truth at the expense of another, namely God’s sovereignty and/or man’s free will. Consequently, Cooper argues that Scripture only speaks of predestination in selective contexts. As we near the end, our eighth article is by an adjunct professor of Criswell College, Paul Michael Vacca. Vacca provides a discourse analysis of Hebrews 7:1-10 for the purpose of discussing how we should understand the relationship between Melchizedek as a priest in the Old Testament and Jesus as the High Priest of the new covenant. Our last entry comes in the form of a surrejoinder by A. Boyd Luter who provides his final thoughts on a previous rejoinder that was addressed to him by Gary Burge. The subject pertains to how the New Testament deals with the role of the land of promise in relationship to national Israel. Finally, this volume concludes with several book reviews in the hopes that they can inform readers about possible works that can improve their theological libraries. And also remember that you can access all past issues of CTR online at atla.com. Your local university or seminary can provide you with a password.